Food and art collide intentionally in the new book from Alain Passard. In The Art of Cooking with Vegetables , of which I received a review copy, he has created a collage to accompany each recipe. He explains that although the food usually inspires the collage, there have been times when creating the collage led to different combinations on the plate. 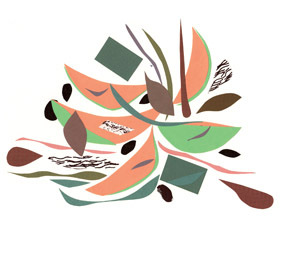 The collages are abstract, colorful, and beautiful. I’d love to have them framed and lined up on a wall. The book was created in celebration of the 25th anniversary of his restaurant L’Arpege with vegetable recipes for each season. The recipes all have simple, straightforward titles in contrast to the complexity of the flavors in the dishes. For instance, Herb-Filled Peppers on Warm Crusty Bread is made with a filling of finely chopped, blanched fava beans, sauteed garlic and onion, and sorrel, cilantro, chervil, basil, and chives. The roasted, stuffed peppers are then served on toasted bread and topped with shaved parmesan. Ratatouille Brittany-Style in Butter is an interesting mix of cooked and raw vegetables with an eggplant and butter sauce served on the side. A recipe I can’t wait to try is the Avocado Souffles with Dark Chocolate. A souffle of mashed avocado, pistachio marzipan, vanilla, and egg whites, of course, is baked in the halved and hallowed avocado skins. A square of dark chocolate is set into each souffle before baking. Puffed, green domes baked in dark, black avocado containers is something I want to see and taste. From the section of the book focused on summer, the first recipe I had to try was the Melon with Blue Cheese and Black Pepper. 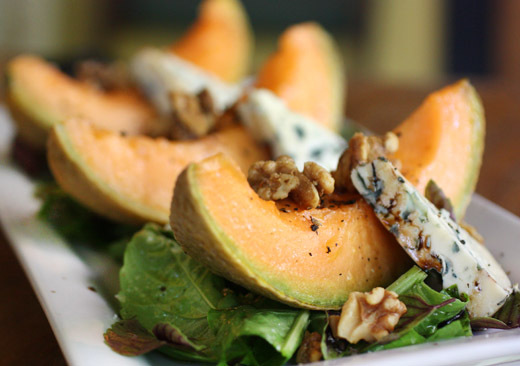 It’s a colorful, sweet-savory, fork-and-knife kind of salad made with fourme d’Ambert which is Kurt’s favorite cheese. I actually planned ahead for this recipe. One of the ingredients is purple basil although green basil would have been fine instead. I had planted purple basil seeds and waited until some leaves appeared to make this. I wish the leaves had been more completely purple, but I went with what I had. The salad also includes sorrel, and red sorrel would have been pretty. Sadly, I was only able to locate green sorrel, but its lemony flavor was great. The colors, textures, sweetness, saltiness, and herbiness were all important here, and one more twist for this salad was the mix of hot and cold. The melon slices were actually stewed in a little olive oil. The melon became just slightly more tender and was the only warm element on the plate. To finish, the plate was drizzled with a little balsamic vinegar, and flaked sea salt and coarsely ground black pepper were added. I had a few walnuts on hand and decided to use them for garnish to add a crunchy item to the mix. 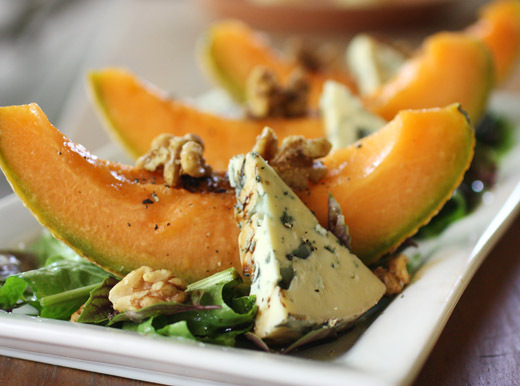 The sweet, warm, orange melon with the savory, big flavor of the blue-veined cheese was well-matched for looks and taste, and the bright mix of herbs cut the richness nicely. It was a surprisingly filling salad with the wedge of melon and chunk of fourme d’Ambert. Now, I’m flipping to the late summer pages of the book to decide which food as art piece to recreate next. Recipe courtesy of Alain Passard, L'Arpege, and Frances Lincoln Publishers, Ltd. Copyright 2012. Excerpted from The Art of Cooking with Vegetables . All rights reserved. Slice the cheese into four equal-sized portions and leave them at room temperature for about half an hour. Meanwhile, cut the melon into quarters, and scoop out and discard the seeds. Thinly cover the bottom of a saute pan with about one tablespoon of the olive oil, holding back the rest; arrange the melon quarters, flat on their sides, in a single layer, in the pan. Partially cover with a lid and stew the melon quarters gently over low heat for 25 minutes, turning them over from time to time. While the melon is stewing gently, put the leaves of sorrel and basil in a salad bowl and dress them gently with the remaining oil. To serve, arrange a quarter of melon, a portion of cheese and a helping of the salad on four individual plates. Season to taste with salt and crushed or coarsely ground black pepper. Sign each plate with a trail of balsamic vinegar. What an easy yet sophisticated dish. 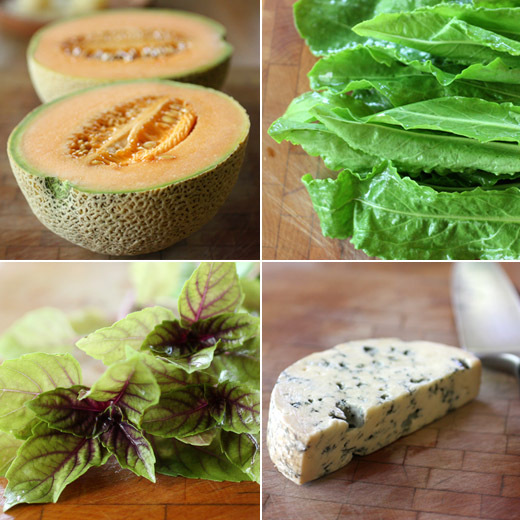 I love to put both blue cheese and black pepper with melon but I love these additions. Your presentation is amazing - I'm saving this post just so I can remember it. An original and refined combination! Perfect. Love the presentation! Will do for my next party. Not a very big fan of blue cheese. This sounds like very different combination ..with melon and cheese! Would have never thought of that. This looks fabulous... And you just gave me an Idea!!!!!! Beautiful presentation! I love the flavours. Adore the magical simplicity of the recipe! Surely a testament to a lush seasonal melon paired with the splendid tangy cheese. A sparkling recipe for the the depths of summer! I'll be taking a closer look at this new cookbook. gorgeous and sophisticated dish! love it! What a lovely recipe. So easy, yet so full of interesting flavors. Will try this tomorrow for dinner! You find the most unique cookbooks! This is different and daring! I love it. Lisa, a few years ago I also planted purple basil in our garden, and the leaves were pretty much like yours in the photo. Not sure why... maybe our part of the world, the soil? The book sounds like a piece of art in itself, Lisa, let alone the wonderful recipes. I love it when a book inspires you to mark so many recipes to try. The melon and cheese is a lovely example. This definitely sounds like a cookbook that I desperately need in my life. I love melons paired with strong cheeses but this dish takes that combo to a whole new level of flavor! Oh my, what a magical combination of ingredients! Well, if Mr. Passard's collages are at all as pretty as your presentation above, they must be works of art. I love your composition of contrasting the wedge of cheese against the mellon slice. I'm sure the dish was just as tasty as it is beautiful! I love how simple this gorgeous dish is. So often you think of recipes from a famous French chef as being too difficult or cumbersome to even attempt. Nice to see that's not always the case. Interesting recipe - I've never cooked melon that way. In fact, other than watermelon rind, I don't believe I've ever cooked melon at all. And I love combing it with the pepper and especially the cheese. Terrific. Thanks.